Areni-1 probably means nothing to you (don’t worry, if you are not an archeologist there is no reason that it should). If you were an archeologist, however, and you had an interest in Armenian metatarsal development, you would probably know that Areni-1 is the oldest shoe on the planet. It isn’t much. Just a single piece of leather hide crudely thatched together at the top and stuffed with straw for insulation and to retain its shape. Needless to say, footwear has come a long way since 3,500 BC (thank goodness!). Recent studies show that we now own, on average, between 9 and 20 shoes at any given time. These come in all shapes, colors, styles, and intended functionalities. As motorcyclists, we require our own unique set of standards for both protection and comfort. Fortunately for us the folks at Alpinestars have us covered… substantially more than Areni-1. 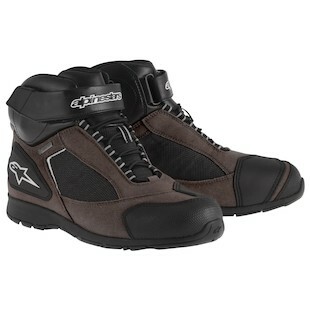 Destined as the replacement for the popular Africa shoe, the Alpinestars Sierra XCR Gore-Tex is a multi-season adventure riding shoe for motorcyclists looking for a rugged, protective, tactically functional alternative to a full-on adventure boot. With features like the Gore Tex XCR membrane for the most extreme of weather conditions and a suede microfiber upper, these shoes offer a solid outdoor trekking boot for when the kickstand is down. After you blaze new paths through uncharted terrain off the bike, however, the dual density ankle protection, high profile ankle securing strap with integrated shank, and TPR reinforcement at the heels and toes will all work to protect you as you set off for the next exotic destination. Built from the same blueprint as the hugely popular New Land GTX boots, the new Alpinestars Gunner WP Shoes offer much of the same style and functionality, yet at a sub $200 price point. With an eventual trajectory aimed at replacing the Roamer, this boot will make use of features such as a synthetic leather main construction, TPU shift protector, and comfort mesh edging to ensure a well-rounded mix of comfort and protective features for long rides on the steel horse. The new Gunner WP Shoe will be slightly lower in the heel than the Roam, which will obviously decrease overall coverage, yet it will also increase the comfort and mobility of the rider while off of the bike. When looking at a great overall boot aimed at the multi-season touring crowd, it will be difficult to find a boot that offers so much at an equivalent price. 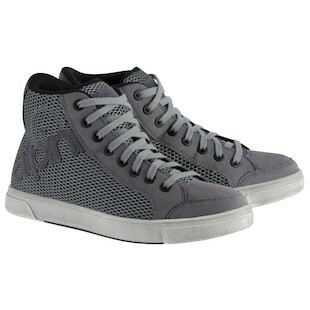 For the more urban commute, Alpinestars has re-imagined the hugely popular Joey with the all new Joey Vented Shoe. This iteration will be constructed out of 3D technical high abrasion mesh construction for maximum airflow to the foot on those hot summer days. As a line addition to the Joey series, this shoe will continue to offer protective features such as dual density sole construction and medial/lateral ankle protection inserts. 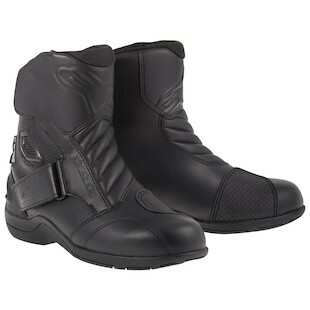 While it is not going to be as protective as a more aggressively designed boot, the Alpinestars Joey Vented Shoes is a great option for urban riders looking for style and comfort both on and off the bike. The right shoes can make all the difference. The importance of proper footwear dates back over three and a half millennia and the evolution of the shoe closely maps the evolution of society around it. For those of us who garner our thrills on two wheels, the combination of technical moto aspects necessary while on the bike and a desire for functional utility upon arrival at our destination creates a fine line to walk (or ride!). So this summer, whether you are taking a trip into the great outdoors, heading out on a long moto tour, or darting around the city, Alpinestars has a shoe designed for the occasion.